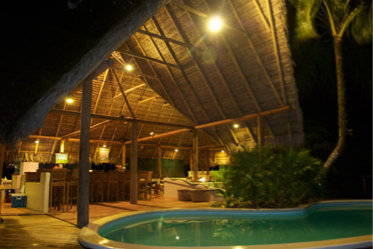 Bosque del Cabo is known for having consistently delicious and plentiful meals. Our food, and guest satisfaction with our restaurant, is really important to us. 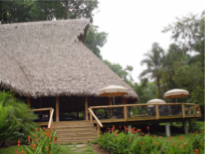 All the meals are made from scratch, and prepared with fresh, local ingredients blending styles from American, Costa Rican, and international cuisines. Breakfast and lunch are served during set hours. 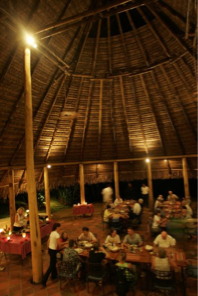 Guests are welcomed to come eat at any time during those hours. Lunch can either be eaten in house or packed to go. The packed lunches are popular since many guests like to spend the day hiking or at the beach. The lunches can be ordered at breakfast and picked up any time. Dinners bring all the guests together at large candle-lit tables. We often serve plentiful buffet style dinners; however, sometimes we will serve plated dinners with a choice of entrée (on these days we will have a board posted with the choices and you will be asked to make a choice during the breakfast hours). Please advise us upon check-in and prior to arrival by email or phone call if you have any special dietary needs or desires. We are happy to accommodate vegetarians. Private dining tables are available; please advise us at the lodge if you are interested. Coffee & tea are available in the restaurant during the day. We serve complimentary tropical juices during breakfast and complimentary iced tea during lunch. Snacks are available during the afternoon (look for them in the coffee service area). Water served with the meals is our filtered spring water. Water in the tap is water from our spring also. We have sealed bottled water available for purchase; we provide our own filtered spring water for free refills. The chilled bottles of water and the filtered water are located in the bar. There is a small library and seating area in the upper part of our restaurant. It is a great place to relax, read and talk. We have weekly conservation talks, usually on Wednesdays from 6-7pm, that we hold in this area. We invite one of the various groups doing conservation work on the Osa to give a multimedia slide show, talk or interactive discussion for our guests. This has become a great tradition at Bosque- it is always free and everyone is invited. Finally, we have provided a high definition Swarovski telescope in the restaurant area in order for our guests to get a better view of the abundant wildlife right around the main lodge. We also have Zeiss 7x30 and Swarovski 8x30 SLC binoculars for half day or full day rental; please inquire with a staff member. Bosque del Cabo has a full service bar located next to our pool, with a newly renovated lounge area. We have great bartenders and the bar is especially popular in the hour before dinner (6-7pm) when the guests will gather to have a cool drink, meet each other and tell stories and adventures from their day. Our bar stocks a selection of wines, Costa Rican and international beers, well drinks, Margaritas, Mojitos and blended Tropical cocktails, plus sodas, lemonade, fruit smoothies and non-alcoholic drinks. Champagne is also available by bottle. Arroz con Pollo- Costa Rica’s most famous and typical dish: Chicken & Rice, combined with sautéed Onions, Red Bell Peppers and Vegetables, infused with traditional Costa Rican flavorings and spices. Que Rico! Grilled Chicken Taco Salad- Grilled Chicken Breast, Black Beans, Corn, Lettuce and Tomato served on a bed of crunchy Tortilla Strips with spicy Chipotle Ranch Dressing and topped with Avocado. Garden Salad garnished with Orange Cumin Vinaigrette.